You saw the video, right? A 14-year-old student was interviewed after she was hit by a vehicle the across the street from Cleveland High School. On the afternoon of 4/28, Vicktorya Courtney was knocked to the ground by the mid-sized SUV as she crossed Powell at 28th. The driver, a female in her 40s, Courtney said, got out of her car and motioned for her to come over. When Courtney couldn’t get up, because she just got hit by a car, the woman just drove away. It was a sick and shocking incident that taps too many stereotypes not to be missed by the media: a probably privileged, wealthy driver of gold SUV hits a child and drives away with her lying in the street. In her defense, she was probably late for her pedicure appointment and just couldn’t be bothered. 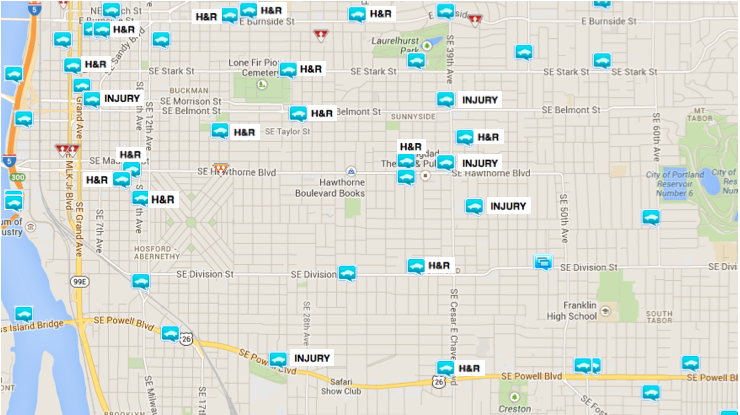 The dramatic incident makes the news, but these kind of incidents are really not that rare: between 4/28 – 5/5 there were 5 injury accidents and 15 hit and runs in Inner SE Portland. It’s impossible to tell from the statistics (from www.crimereports.com) if these traffic incidents are pedestrian-vehicle or vehicle-vehicle, but it’s obvious many people in this town are running from their responsibility. And it’s also obvious that people are getting hurt nearly every day on the streets of Portland. happy that you just sharred this useful info with us.